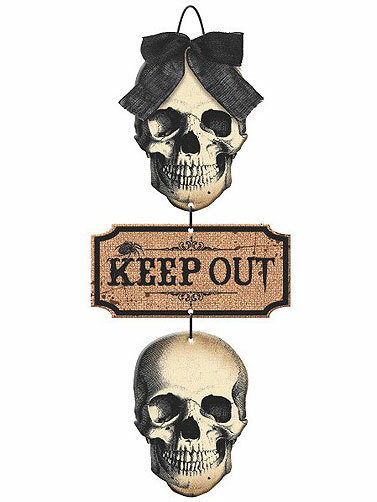 Our Boneyard Keep Out Sign is great for keeping folks out of areas you would prefer they not go and makes a scary Halloween decoration. This three piece fiberboard stacked sign is held together by a black ribbon with a bow at the top. Sign has a vintage look and features a skull sign on the top and the bottom. The center sign is covered in Burlap and reads "Keep Out". Ribbon loop at top for displaying. Boneyard Keep Out Sign measures 18"H x 8.75"W.